Boonie Bust Up: A Tale of Seven Boonie Hats. The evolution of the boonie hat started in the early 1960's in popular U.S. military culture and has continued to evolve for five decades. By popular accounts the “boonie hat” or soft hat evolved from locally procured full brim fabric hats during the Vietnam Conflict beginning with the French occupation of Indochina and accelerating with the arrival of U.S. Special Forces advisors in the early 1960’s. Most early boonie hats were procured locally in South Vietnam. The local manufacture of boonie hats became a significant cottage industry that survives to this day in modern Vietnam. Now the hats are sold in Vietnam mostly as souvenirs of the “American War”. The boonie hat came into popular use by Special Operations teams such as the U.S. Army Special Forces and ARVN units along with counter insurgency units such as Naval Special Warfare teams. The most photographed users seem to be the U.S. Army “LRP” or “LRRP” teams, “Long Range Reconnaissance Patrol” teams used to locate and harass the North Vietnamese and Viet Cong insurgents and provide bomb damage assessment after air strikes. These teams favored the soft boonie hat to a helmet since it was cooler to wear, did not interfere with hearing and broke up the outline of the soldier’s head assisting with concealment. The brim also provided a measure of comfort against monsoon rain and hot sun. The original Vietnamese boonie hat in tiger stripe camouflage. Notice the missing camouflage loops and the pointed top. This example was purchased in downtown Hanoi, Vietnam. 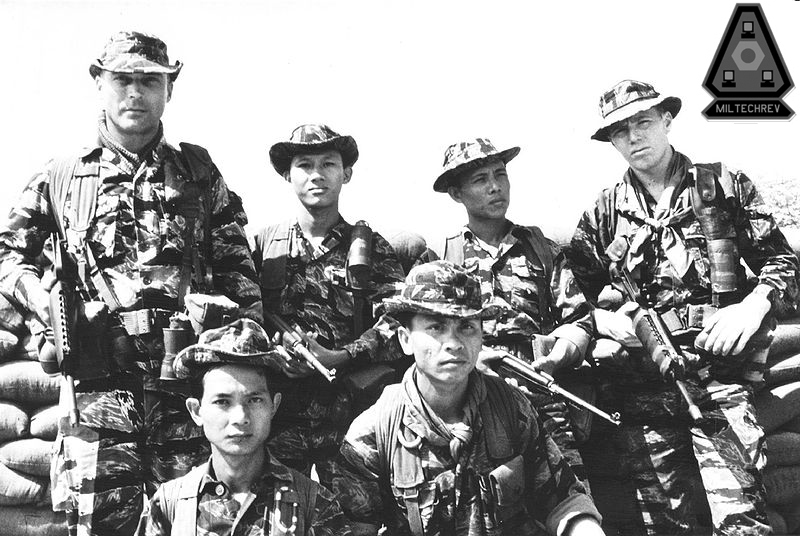 The boonie hat was popularized in U.S. military culture by Long Range Reconnaissance Patrol (LRRP) Teams such as this one in Vietnam in 1968. Another locally available version of the boonie hat still seen today was a solid color reversible version with desert tan on one side and solid Olive Drab on the other. This version was made popular by intelligence organizations and private military contractors who were either discouraged or prohibited from wearing camouflage apparel or military uniforms. The Olive Drab side had vertical loops sewn onto the side. This boonie hat is reversible from desert tan to olive drab with the olive drab side having loops to insert foliage for camouflage. These were never issued but used by intelligence organizations and private contractors and are seen everywhere as casual wear from beach tourists to Abercrombie alterna-teens. The loops on boonie hats have remained a fixture although there is confusion about what the fabric loops around the crown of the hat are actually for. Some people (mostly civilians) thought the loops were to store ammunition, which would not have worked. The purpose of the loops is to thread pieces of foliage as natural camouflage to further break up the outline of the soldier and help them blend into their surroundings. U.S.defense contractors did begin to produce official issue boonie hats for servicemen deployed to hot weather regions after the success with locally procured ones in Southeast Asia. The U.S. Army and the U.S. Marines were early adopters of issue boonie hats, solid olive drab for the U.S. Army and later woodland camouflage and then the “digital” pixelated camouflage schemes for the U.S. Army ACU’s and in the U.S. Marines’ distinctive desert and woodland pixelated scheme. The U.S. Army also adopted a “chocolate chip” or five color camouflage boonie hat and a later (still used by some units, especially Naval Special Warfare) three color camouflage. Some Middle Eastern countries also adopted these uniforms, most notably Egypt with the five color desert uniform. The U.S. Marine Corp issue boonie hat had a large brim, four vents, the Globe and Anchor embroidered logo and a built-in sweat band inside the front of the cover. A notable feature on the USMC issue version of the boonie hat is the Globe and Anchor Marine insignia embroidered on the front of the “cover”. These covers (Marine vernacular for hat) were manufactured by Sekri Industries and sold in size names “Small”, “Medium” and “Large”. Marines in Iraq during Gulf II believed that the hat should be worn in the largest possible size for comfort and maximum shade. The Marine insignia is more than a matter of pride, it also signifies the front of the hat, where a sweat band is located to absorb perspiration. The hat features four metal mesh vents nd uses a generous 2.87 inch wide (7 cm) brim. There is a chin lanyard and the ubiquitous webbing loops around the crown of the hat for camouflage. The military issue boonie hats gave way to a storm of commercially produced boonies in various camouflage schemes based on military camouflage. These are used by military enthusiasts, private contractors, law enforcement and foreign government military units. 5.11 Tactical makes a version with a 2.25 inch (5.7 cm) brim, four mesh vents, chin strap, camouflage retention bands and a hidden pocket in the top of the hat for concealing a thin, flat object like ID card or plans for your secret missions. 5.11 Tactical's boonie hat is inexpensive, lightweight, has a nice brim width and a unique hidden pocket in the top. The camouflage mimmicks (but is not an exact match of) USMC desert camo. In 2004 Caleb Crye introduced a seven color camouflage scheme intended to be used in all terrains and climatological zones. It provides visual concealment in desert, woodland, arid and even tundra settings. The idea is to replace the need for separate woodland and desert camouflage uniforms while increasing the overall effectiveness of the soldier’s battle dress in providing tactical concealment. The result is Crye Precision’s patented Multicam pattern. Multicam has been adopted by the U.S. Army, many military and law enforcement special operations teams such as the U.S. Drug Enforcement Agency and is popular in the civilian/tactical enthusiast market. Well conceived details like a drawstring around the crown of the hat, large integrated vents along the side and a Velcro IFF patch holder on top set the Crye Precision Multicam boonie hat apart. Crye Precision's Multicam boonie hat is packed with features like a drawstring crown, large discreet side vents, Velcro pile IFF patch on top and a nicely sized brim. 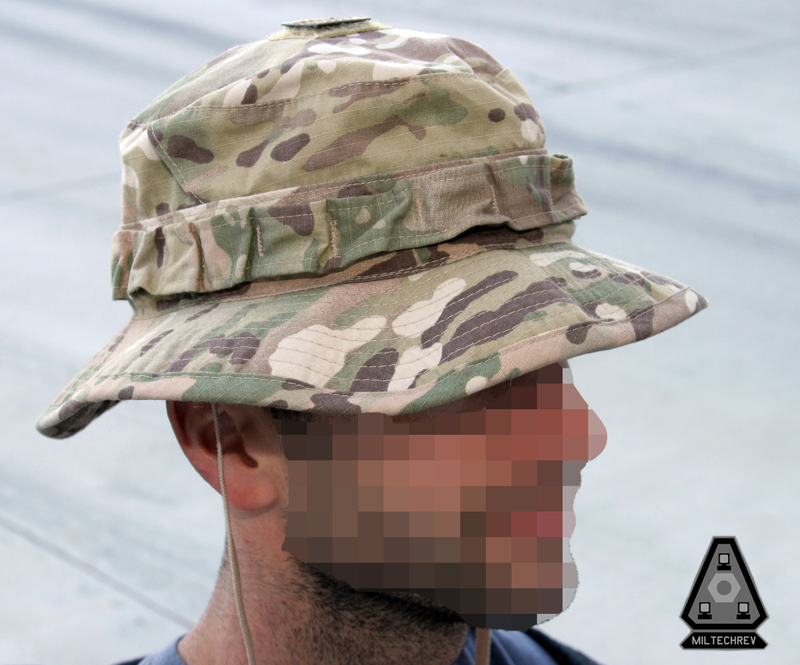 The next evolution in boonie hats tracks with the development of Digital Concealment Systems’ (DCS) A-TACS camouflage pattern. A-TACS is a pixelated camouflaged system using “organic pixels” This camouflage pattern is created from an algorithm of computer interpreted light patterns and is a much tighter, smaller set of pixels more closely mimicking not only colors in the natural environment but also the behavior of light and shadow. The result is a hauntingly effective camouflage pattern. Current A-TACS is intended for arid, rocky, desert and high desert terrains but also crosses over effectively to some high alpine and dry wooded areas. Digital Concealment Systems just released the new A-TACS FG camouflage for use in jungle, heavily wooded and deep foliage areas. This new camouflage pattern is distinctly more green than the original arid terrain A-TACS. A big part of the A-TACS concealment system is the philosophy of applying the camouflage pattern to all of the operators equipment, from battle dress to personal equipment and backpacks to weapons. Obviously headgear is included. Tactical Performance Corporation of California has continued the development of their evolved A-TACS uniforms with the introduction of two A-TACS patterned boonie hats. Tactical Performance Corporation of California was one of the first companies to show two versions of an A-TACS patterned boonie hat with their C-2000AT A-TACS Boonie Hat and their unique C-2100AT Sniper Boonie Hat. The C-2000AT A-TACS Boonie Hat from Tactical Performance Corporation is a conventionally configured boonie with a 2.5 inch (6 cm.) brim similar in size to Crye Precision’s boonie. This is an optimal size for the brim of a boonie hat in our opinion as it provides adequate sun shade, spills rain and does not interfere with your field of vision as much as larger brim boonie and sun hats. The hat is ripstop 50/50 NYCO fabric and uses the metal mesh vents and small chin strap along with a series of loops around the crown for camouflage. The A-TACS camouflage pattern is uncanny in the high desert. Don’t set this hat on the ground- you’ll have a tough time finding it since it blends in so effectively even at close range. The Tactical Performance Corporation Sniper Boonie in A-TACS is difficult to manufacture but effective in breaking up the wearer's outline. The second version of the Tactical Performance Corporation boonie hat is the unusual C-2100AT Sniper Boonie Hat. One of the principles of camouflage is to break up the outline of the shape against its background rendering it less recognizable.. The Tactical Performance Sniper Boonie Hat has a brim with ghillie suit style simulated foliage around the outside. This breaks up the outline of the operator’s head, casts unusual shadows and creates visual confusion even at short range. When combined with cut natural foliage inserted into the camouflage retaining loops around the hat it becomes even more effective. The vents on the C-2100AT Sniper Boonie Hat are very similar to the Crye Precision boonie. They are large slots in the main section of the hat instead of little screens. There is also a drawstring around the crown of the hat to secure it. In terms of providing concealment, this is the most effective of the boonie hats since it not only blends into the background due to the A-TACS camouflage pattern but it effectively breaks up the wearer’s outline with the unusual trim on the brim. Tactical Performance Corporation's C-2000AT A-TACS Boonie Hat has a perfect brim size and uses ripstop 50/50 NYCO fabric. Boonie hats have become synonymous with the special operations soldier, law enforcement SWAT team and military/tactical enthusiast. The evolution of the boonie over the past half century has brought us to the new advanced designs from Crye Precision and Tactical Performance Corporation. More than any time in military history the boonie hat has become an important part of soldier, operator and tactical enthusiast’s wardrobe.